Tuesday, September 24th, 2013 | Author: Bunco Betty! Fall is officially here. Pumpkin flavored beverages and desserts are already everywhere. Even though I live in the desert and the weather is still quite warm, thoughts of fall bring hope of cooler weather and fun get-togethers with family and friends like Halloween and Thanksgiving. This will be the fourth fall that my Bunco group has been together. We have played Harvest Bunco, Halloween Bunco (twice) and had an Apple themed Bunco. I always coordinate the color of our Bunco sheets according to the monthly theme. For Halloween Bunco I use orange and green paper, for Apple themed Bunco, red and gr een and for Harvest Bunco, gold, light brown and green. This time of year there are cute fall paper products available: plates, cups, napkins, etc. which add to the festive atmosphere. Another fun thing about fall themes are the endless food and beverage possibilities. For Harvest Bunco we had mulled wine (check out these cute wine charms), for Apple Bunco we had hot spiced cider and for Halloween Bunco the hostess put dry ice in the punch and it looked like witches brew. We have potlucks at our games and the ladies are very creative! One of my favorite recipes for fall is a pumpkin dip I found on Allrecipes.com. I made it for my Brownie Troop last week and one of the girls asked if she could lick the bowl! Best of all it is inexpensive and easy to put together. 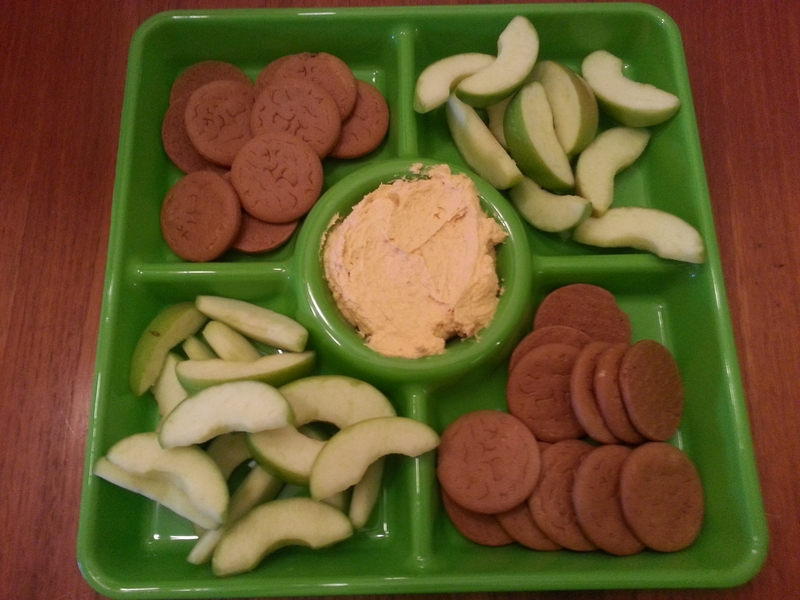 It tastes great served with apple slices, ginger snaps and/or Nilla Wafers. In a large bowl, mix together instant vanilla pudding mix, pumpkin and pumpkin pie spice. Fold in the thawed frozen whipped topping. Chill in the refrigerator until serving. Prizes for Fall Bunco are fun to coordinate with the theme. Some of my favorite prizes are seasonal dish towels, candles, welcome signs and aprons. This Halloween Dice Bracelet would be a perfect Bunco prize! What Fall Bunco Themes (Halloween, Harvest, etc. )have you done with your Bunco group? What are your favorite prizes and recipes for Fall Bunco themes?